Forget the tune. Petra Pan dug around her closet (or went back to Hot Topic) and ironed out the white tanktop, tie and stringy black capris from her days as a 17-year-old hater of authority figures and bare wrists. 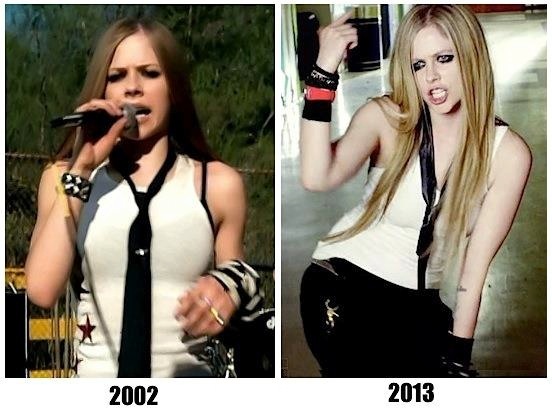 Lavigne, now 28, really hasn’t aged much since those years. She’s still the same adorably eager hyena that says “boombox” with a weird accent that really can’t be classified as Canadian. And believe me, I’m a sucker for nostalgia. I’d be all over Britney putting on the snake scarf and tweaking the lyrics to “I’m a Slave 4 You,” but this is just plain baaaaad. She’s skateboarding down the hallway like she just sacrificed her first Barbie to the NOFX gods. What was that crappy song by Kid Rock that made sane people want to funnel spiders into their ears? “All Summer Long.” Yes. The Chad Kroeger-approved two-for-one special. Here’s to the mute button.